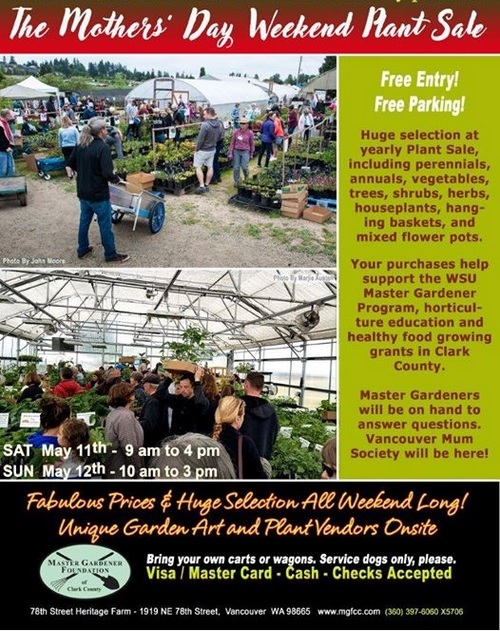 The WSU Master Gardeners of Clark County are having their annual Plant Sale this coming Mother’s Day weekend! Don’t miss it! When: May 11, Saturday, 9am-4pm & May 12, Sunday, 10am-3pm. Where: Heritage Farm, 1919 NW 78th St., Vancouver, WA. Why: To support the WSU Master Gardener programs, horticulture education and food growing grants – AND, of course to pick up some fabulous plants and gardening “stuff” for your own garden! What: every year, they have an amazing VEGETABLES selection that will do well in Clark County, plus many more types of plants, and also garden art and plant vendors. How: Bring your own cart or wagon. Free entry and parking. Arrive early for best selection! Previous post ← March 27th Speaker – Vern Schanilec on best PNW trees & shrubs!